Media: Soft glossy covers, portrait format (11.25” x 8”), printed on 72 good quality semi-gloss pages (expanded from the original’s 56 pages). 4 pages of colour illustrations covering colour schemes and cockpit, 3 pages + 1 A3 loose insert of 1/72-scale plans, many B/W photos and diagrams + 7 pages of colour photos. Price: £10.90, plus £0.60 post & packing (UK – see below for availability elsewhere). Advantages: Revised and expanded edition of the original 1994 publication. Greater coverage of the development aircraft and the F-15 Reporter. Good range of both black & white and colour photos (now including the Wright-Patterson P-61C and Beijing Aeronautical Institute’s P-61B), as well as numerous diagrams and scale plans. Like the Mustang, the Black Widow was another aircraft originally conceived to meet the (then) immediate requirements of the RAF, but which in the end was adopted and operated to great effect by the USAAF. The result was a twin-boomed, twin-engined nightfighter (later developed into a photo-reconnaissance platform), linking the near-performance of a single-engined fighter to a devastating array of firepower, creating a formidable aircraft which saw action in both the European and Pacific theatres of war. The first edition of this book was published in 1994, though not seen by this reviewer, as I didn’t return to the aircraft modelling ‘fold’ until relatively recently. Whilst that book predominantly concerned itself with the P-61, this expanded and revised edition now includes more detail on both the development aircraft and the later F-15 Reporter PR version developed from it, as well as adding 7 pages of colour photos of surviving examples. Miroslav Balous’s book is a bilingual publication in Czech and English throughout, this includes the main text and all captions and diagrams. The way this is achieved varies at different points. Mostly, chapters are split into two columns (Czech on the left, English on the right), however at other times, the chapter is effectively repeated (i.e. the Czech version first, followed by the English translation, with the result that different photos or diagrams are interspersed with each text). Whilst not really a problem, it was disconcerting the first time I looked through it, as I thought that a ‘Czech-only’ chapter had crept in! This does mean however, that on the occasions where the latter method is used, the later English text is divorced from the corresponding photographs or diagrams, necessitating the need to flick backwards and forwards. Perhaps I’m being a little uncharitable here (as Czech readers will also have to flick forwards and then backwards, for the same reasons) as once you realise what is going on, the ‘flow’ of the book is not disrupted too much. Getting down to the content. Inevitably, the book begins with a background to the design’s inception, though the first chapter is actually a description of Lt. Herman E. Ernst’s bringing down of a V-1 on 16 July 1944 – the Widow’s first night-kill of such a device. The development covers the prototypes, including the early proposals with front and rear turrets, as well as ducted cooling air through large propeller spinners. This development of the airframe is also paralleled by that of a suitable radar set. Subsequent chapters cover the design and development of the P-61A and P-61B and the subsequent performance in service. This is followed by chapters on the P-61C & D, and then the XP-61E which led on to the F-15 Reporter. 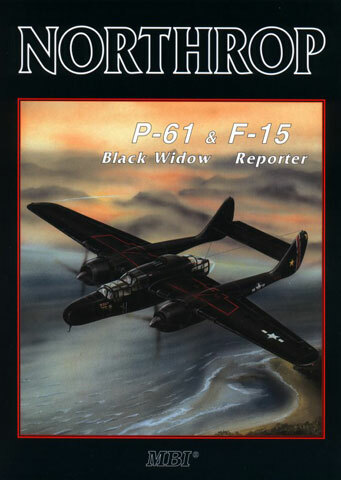 The Reporter is covered in reasonable detail, followed by two short chapters on Black Widow/Reporter use as development aircraft (NACA) and by post-war civilian operators. The final chapter is an illustrated technical description of the Widow, including a technical data table covering all the variants. Throughout, chapters are well illustrated with black and white photographs, diagrams (including P-61A and B cockpits) and technical illustrations. There are colour artworks showing various paint schemes and a coloured illustration artwork of a P-61B cockpit. As mentioned above, the colour photographs now included in this second edition, cover the Wright-Patterson Museum’s P-61C and the P-61B at the Beijing Aeronautical Institute (the latter looking somewhat battered after all those post-war years out in the open). I do not claim to be an ‘expert’ on any aircraft and I’m certainly not as well clued-up on the P-61 as some other types. So if there are any technical errors in this book, they weren’t obvious to me (someone else will have to stick their head above the parapet on that one!). If there were a slight criticism, it would be that a separate table compiling the data on production batches, serial numbers, etc, would have been useful, rather than leaving the reader to extract such data from the chapters on each variant. That said, there is a wealth of detail in this book (reviewer’s cliché #16), which will be invaluable to the modeller or the merely interested. This value is enhanced when you consider the very reasonable cost, coupled to the quality of the reproduction and the materials used. As an adjunct to Squadron’s “P-61 Black Widow in Action”, this book is a more than useful work, which I feel would give me most of what I would need to know to attempt a competent model of Northrop’s deadly lady. Recommended to anyone waiting patiently for that AMtech kit (now apparently scheduled for release in mid-2004 at the earliest). Review copy courtesy of my wallet (Try not to let this happen again. Wallet). B1-10/F Kong Nam Ind. Bldg.